With the ELD mandate taking effect, the issue of truck driver safety is at the forefront of logistics industry news. This is a good thing as driver safety is the foundation of our industry – and it needs to improve. According to the Federal Motor Carrier Safety Administration (FMCSA), there were 4,050 large trucks involved in fatal accidents in 2015, an 8% increase from 2014. In this blog post, we will examine the dangers and promote methods by which they can be reduced. At KANE, we understand that driver safety is not one thing – it’s every thing. We take a holistic approach to safety that begins, as illustrated in our previous blog post, with better driver hires. And, whether you’re a fleet owner or a retailer or manufacturer who relies on carriers, here are additional elements of our approach that can positively impact truck driver safety. Provide a thorough orientation. Driver orientation needs to involve much more than paperwork and a key. It should involve face-to-face time between the driver and other departments and associates, including other drivers. New drivers need ample exposure to the operation which can mean a longer ride-along period for getting accustomed to the truck, the equipment, and the dispatch system. Most importantly, orientation needs to lay the groundwork for continued communication between the driver and the company. Drivers should understand that feedback is welcome and encouraged, and is not simply a form of complaining. Prevent distracted driving. Company leadership must foster a culture in which drivers know that they are not to be holding a phone from behind the wheel. Ever. Not even in the yard. Implementing this culture can involve anything from meetings and repeated safety messaging to onboard cameras which monitor drivers while they’re on the clock. Provide schedules in advance. By noon each day at KANE, every driver knows his or her schedule for the next full day. So, at any given point, every driver knows what the next 36 hours or so look like and can plan accordingly. If a driver encounters timing hiccups that can affect tomorrow’s schedule, he or she can work with dispatch to make modifications in advance. This removes stress from the driver – resulting in safer driving – and saves the company from having to scramble at the last minute to fix avoidable problems. Monitor performance and act upon information. 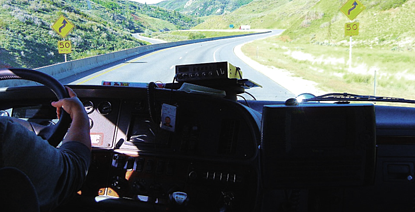 The electronic logging devices (ELD) that are causing such a stir are vital tools that prevent drivers from being on the road beyond the regulated hours of service. When it comes to truck technology, however, ELDs are just the tip of the iceberg. Trucks are now like giant computers on wheels, where everything down to braking pressure can be recorded and analyzed. This information can lead to better training and improved performance for individual drivers. For instance, if a driver’s data shows irregularities or a worrisome pattern, that creates an opportunity for the company to provide guidance or even take the driver off the road for a few days. The ELD mandate removes any leeway that drivers had through logging hours with pen and paper. At KANE, our truck driver safety efforts include technology that extends far beyond ELDs, but it all starts with people – the relationship between the company and our drivers. Many thanks to Tom Paciga, KANE's Transportation Safety Manager, for his assistance in writing this post.